With a population of over 9 million spread 1,191 sq mi, Cairo is by far the largest city in Egypt. 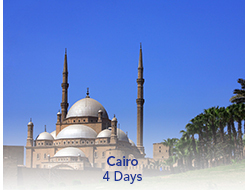 Your tour includes city sightseeing and visits to the Pyramids of Giza and the Sphinx. Your day at leisure could include an optional visit to the famous Egyptian Museum.